Assuming your wiring uses the ‘old’ core cable colours i.e Red (live), Black (neutral) and Green/Yellow (earth) then Fig.1 shows the most common way your ceiling rose will be connected. Click Here – If the cables in your house have Brown (live), Blue (neutral) and Green/Yellow (earth) cores. Cable A and Cable B are the live, neutral and earth loop to each of the lights in the circuit, (Cable A feeds in the live supply from the previous light in the circuit and cable B loops out to supply the next light in the circuit) these cables remain ‘live’ even if the light switch is off, this is why you should ALWAYS make sure the circuit is isolated before you start work. Cable C is a twin Red and Earth which is connected to the light-switch. 1 and 8 – the live and neutral conductors that connect to the ceiling rose lamp holder. 2 – the return live (switch-wire) from the light-switch. 3 – the live feed to the light-switch. 4 and 5 – both permenantly live conductors. 6 and 7 – both neutral conductors. 9 – the common earth terminal where the Earth conductors from each cable are terminated, the Earth cables must be connected to the terminal (these Earth wires may be bare copper in which case you should sheath them with Green/Yellow sleeving). You should also make sure the earth at the light-switch end is connected to the Earth terminal of the metal back box and/or metal light-switch if used. If the number of red & Black wires doesn’t quite tally-up with that shown above, one of the following will be the case. Fig 2 – shows a common deviation from that shown in Fig. 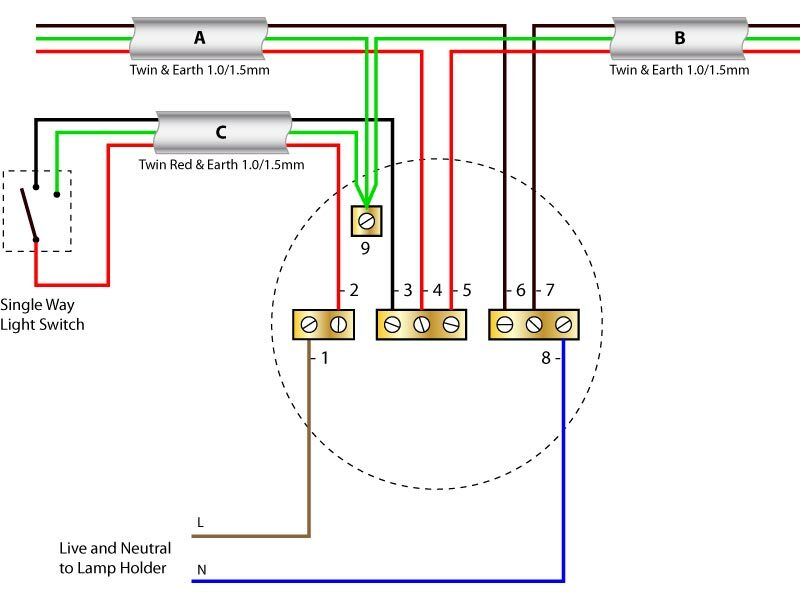 1 here the electrician has used twin and earth for cable C (Red and Black) instead of twin Red and Earth as the switch wire, the Black conductor should really be sheathed with Red sleeving to show it is a live conductor, if it is not, before attempting to replace the ceiling rose you should mark this conductor with either Red sleeving or insulating tape to avoid problems when reconnecting the ceiling rose. 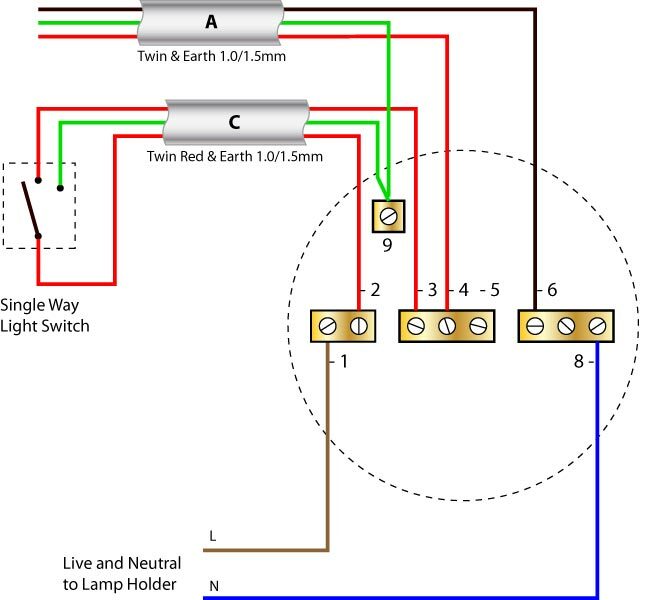 Fig 3 – shows the last ceiling rose on a circuit and therefore there is only two cables present, cable A is the live, neutral and earth supply, cable C is the twin Red and Earth to the switch. If the cables in your ceiling rose are Brown and Blue and not Red and Black as shown above then see the alternative wiring diagrams.